RAVENOL MGS SAE 15W-40 is high performance multi-grade engine oil suitable for the lubrication of natural gas engines. It has excellent lubricating film adhesion, very good shear stability and an excellent cleaning power and high resistance to aging. 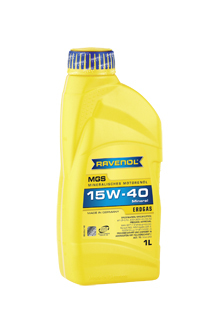 RAVENOL MGS SAE 15W-40 is suitable to apply as a multi-grade engine oil for natural gasengines. A very good shear stability. Very good cold start behaviour. Avoids the formation of accumulations of mud (black sludge). An excellent viscosity temperature behaviour. No problems with the use in catalyst vehicles. Convincing detergent and dispersant attributes. High security reserves even under limited lubrication conditions.